Indigenous students enrolling in the University of New Brunswick in Fredericton and Saint John now have access to a special bursary program, thanks to a $500,000 gift from CIBC to UNB’s It Begins Here campaign. The CIBC-University of New Brunswick Indigenous Bursaries will be awarded to undergraduates with demonstrated financial need. Preference will be given to students enrolled in Bachelor of Business Administration programs. The bursaries are open to First Nations, Inuit and Métis students. Indspire, Canada’s premier Indigenous-led non-profit, will manage, leverage and award the bursaries. Indspire’s national scholarship application process ensures that the CIBC-University of New Brunswick Indigenous Bursaries will be accessible to students across Canada, while its Building Brighter Futures: Bursaries, Scholarships, and Awards has the potential to increase the value and number of bursaries that can be awarded by securing matching funds from the Government of Canada. CIBC has been a proud supporter of Indspire since 1993. The new bursaries were announced at a ceremony in Fredericton on Sept. 11, which paid tribute to the creative capacity, leadership and determination of the First Peoples of New Brunswick and to CIBC and UNB’s commitment to honour the recommendations of the national Truth and Reconciliation Commission. The ceremony included members of the Indigenous community, including UNB Elder-in-Residence Imelda Perley. 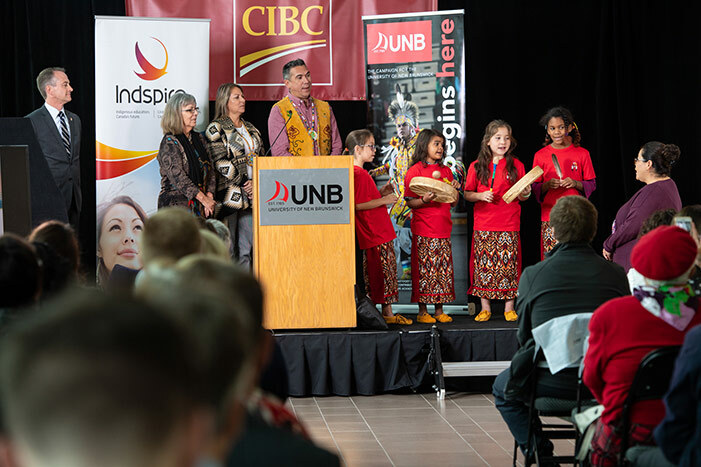 Alicia Dubois, market vice president, Indigenous markets – commercial banking at CIBC, said the bank’s partnership with UNB was part of a larger effort to serve the Indigenous community. “We’re happy to be working with UNB and Indspire to support Indigenous students. CIBC is committed to recognizing excellence and encouraging role models to stimulate further achievement among Indigenous people,” Ms. Dubois said. “We are happy to be working with CIBC and UNB to be a catalyst for Indigenous people achieving their potential,” she said. UNB has adopted a TRC Strategic Action Plan to address the national Truth and Reconciliation recommendations. Action items that UNB is pursuing include establishing an Indigenous Advisory Council and hiring a Piluwitahasuwin (Assistant Vice-President Indigenous Engagement) to lead Truth and Reconciliation efforts within the university. Over the past five years, CIBC has contributed more than $5 million to organizations and programs supporting Indigenous communities. CIBC recently announced an increased commitment of $1 million to Indspire for the Building Brighter Futures campaign, which funds academic bursaries and scholarships. Indspire is an Indigenous-led registered charity that invests in the education of Indigenous people for the long-term benefit of these individuals, their families and communities, and Canada. With the support of its funding partners, Indspire disburses financial awards, delivers programs, and shares resources with the goal of closing the gap in Indigenous education. Through the K-12 Institute, it provides resources to educators, communities, and other stakeholders who are committed to improving kindergarten to grade 12 outcomes for Indigenous youth. In 2017-18, Indspire provided $14.2 million through over 4,900 bursaries and scholarships to First Nations, Inuit, and Métis students. The University of New Brunswick (UNB) is Canada’s oldest English-language university. Founded in 1785, the multi-campus institution has a rich history and a dynamic focus on innovation, experiential learning and entrepreneurship. UNB has more than 10,500 students from nearly 100 countries while several thousand more take UNB courses online and at partner institutions around the world.